‘Plop’ a sound that was once frequently heard along the banks of the Hogsmill, as a startled water vole lunges from the bankside into the relative safety of the river. In recent years our river has fallen silent from these splashing sounds as our water vole population has collapsed. Water voles were once common across the United Kingdom, though they are now the fastest declining mammal in Britain. This once thriving river has a rich history entwined with these furry mammals. The famous Milias painting ‘Opheila’ which backdrop was set on the banks of the river originally was planned to feature a water vole paddling through the scene. This unfortunately was removed when people thought it could be mistaken for a rat. Though when the painting is removed from the frame in the hidden corners, you can still see draft sketches of the water vole. In more recent history, local residents recall only decades ago a time when the Hogsmill was teaming with water voles, where you could stand on bridges and banks and watch on as water voles go about their daily business, which typically involves chopping on sedges and grasses with their large incisors. These charismatic creatures not only enrich the lives of local people, but have essential ecological functions, helping to support food webs as prey for many other species. There are many factors which have contributed to the decline of our water voles, these have included the destruction of river habitat, fragmented populations and the introduction of the invasive American Mink and potential implications with poor water quality. This has led to the decline and potential extinction of water voles on the Hogsmill, as there have been no verified records in almost two decades. However, all hope is not lost. 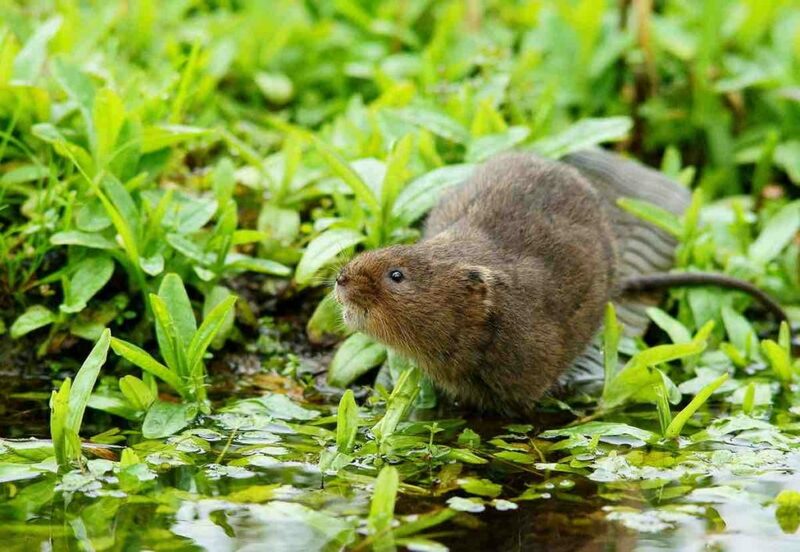 Successful water vole reintroductions are being carried across the country, which is bolstering and restoring water vole populations. Leading the charge is pioneer conservationist Derek Gow, who among other exciting things, breeds water voles on an impressive scale at his farm in Devon. He then works with groups across the country advising water vole releases, which has proven highly successful in recent years. I am pleased to say that last week Derek joined us on the banks of the Hogsmill to discuss the feasibility of potential future reintroduction. The day saw us explore the Thames Water Hogsmill sewage plant and their nature reserve, which was full of bird life including a water rail strolling along the banks. Derek thought the nature reserve could easily support a water vole population, which was very pleasing news for Kristine Boudreau the nature reserve manger who has been doing a great job tirelessly working to enhance the area over the last few years. Following this we explored up the catchment, discussing our future works at the Raeburn Open Space LNR and looking at other potential areas as the whole catchment would need to be in a favourable condition before a release could take place. Elmbridge Meadows was deemed to be an appropriate site, though as we moved deeper into the Surrey elements of the catchment, it was concluded that significant tree work will need to take place to create grassier open habitat and increase the light levels which reach the river. We also discussed the presence of American Mink, which have been recently sighted in multiple areas along the river. Derek thought due to the relative isolation of the catchment that a strategically implemented eradication programme would be effective, this followed by monitoring would mean that this threat could be controlled. It was thought that 16 mink rafts and a motivated team of water vole volunteers to help monitor the traps would work very well. We excitingly concluded the day at Home Park, where there has been some fantastic habitat improvement works, which could support water voles in good numbers. However, there is an active mink population which would need to be addressed first, we were shown mink rafts which had well-formed mink foot prints. If the Hogsmill were once to again to harbour a healthy population of water voles, this would be a fantastic triumph for many reasons. One is that it will have meant that we have restored an enigmatic species that once thrived in the river, reversing a demise which was purely caused from human activities. Though perhaps more importantly, it would mean that we would have successfully improved our urban river to be in an appropriate state to support not only water voles but a wealth of other biodiversity, making it a healthier place for all to enjoy. If this aspiration is to be achieved we will need to form a working group of organisations, local government and local residents to make sure we can all collaborate to work towards this goal. We would like to thank Derek for giving us his time and helping us believe that this is a possibility. If you have any questions about this or about water voles, please do get in touch.